Xcode is an integrated development environment (IDE) for macOS containing a suite of software development tools developed by Apple for developing software for macOS, iOS, watchOS, and tvOS. First released in 2003, the latest stable release is version 10.2 and is available via the Mac App Store free of charge for macOS High Sierra and macOS Mojave users. Registered developers can download preview releases and prior versions of the suite through the Apple Developer website. Xcode can build fat binary files containing code for multiple architectures with the Mach-O executable format. These are called universal binary files, which allow software to run on both PowerPC and Intel-based (x86) platforms and that can include both 32-bit and 64-bit code for both architectures. Using the iOS SDK, Xcode can also be used to compile and debug applications for iOS that run on ARM architecture processors. Xcode includes the GUI tool Instruments, which runs atop a dynamic tracing framework, DTrace, created by Sun Microsystems and released as part of OpenSolaris. The main application of the suite is the integrated development environment (IDE), also named Xcode. The Xcode suite includes most of Apple's developer documentation, and built-in Interface Builder, an application used to construct graphical user interfaces. Up to Xcode 4.1, the Xcode suite included a modified version of the GNU Compiler Collection. In Xcode 3.1 up to Xcode 4.6.3, it included the LLVM-GCC compiler, with front ends from the GNU Compiler Collection and a code generator based on LLVM. In Xcode 3.2 and later, it included the Clang C/C++/Objective-C compiler, with newly-written front ends and a code generator based on LLVM, and the Clang static analyzer. Starting with Xcode 4.2, the Clang compiler became the default compiler, Starting with Xcode 5.0, Clang was the only compiler provided. Up to Xcode 4.6.3, the Xcode suite used the GNU Debugger (GDB) as the back-end for the IDE's debugger. Starting with Xcode 4.3, the LLDB debugger was also provided; starting with Xcode 4.5 LLDB replaced GDB as the default back-end for the IDE's debugger. Starting with Xcode 5.0, GDB was no longer supplied. Formerly, Xcode supported distributing a product build process over multiple systems. One technology involved was named Shared Workgroup Build, which used the Bonjour protocol to automatically discover systems providing compiler services, and a modified version of the free software product distcc to facilitate the distribution of workloads. Earlier versions of Xcode provided a system named Dedicated Network Builds. These features are absent in the supported versions of Xcode. Xcode also includes Apple's WebObjects tools and frameworks for building Java web applications and web services (formerly sold as a separate product). As of Xcode 3.0, Apple dropped WebObjects development inside Xcode; WOLips should be used instead. Xcode 3 still includes the WebObjects frameworks. Xcode 2.0 was released with Mac OS X v10.4 "Tiger". It included the Quartz Composer visual programming language, better Code Sense indexing for Java, and Ant support. It also included the Apple Reference Library tool, which allows searching and reading online documentation from Apple's website and documentation installed on a local computer. The final version of Xcode for Mac OS X v10.4 was 2.5. Xcode 3.2.6 is the last version that can be downloaded for free for users of Mac OS X v10.6. Downloading it requires a free registration at Apple's developer site. In June 2010, at the Apple Worldwide Developers Conference version 4 of Xcode was announced during the Developer Tools State of the Union address. Version 4 of the developer tools consolidates the Xcode editing tools and Interface Builder into one application, among other enhancements. Apple released the final version of Xcode 4.0 on March 9, 2011. The software was made available for free to all registered members of the $99 per year Mac Developer program and the $99 per year iOS Developer program. It was also sold for $4.99 to non-members on the Mac App Store (no longer available). Xcode 4.0 drops support for many older systems, including all PowerPC development and software development kits (SDKs) for Mac OS X 10.4 and 10.5, and all iOS SDKs older than 4.3. The deployment target can still be set to produce binaries for those older platforms, but for Mac OS platforms, one is then limited to creating x86 and x86-64 binaries. Later, Xcode was free to the general public. Before version 4.1, Xcode cost $4.99. On January 28, 2013, iOS 6.1 and Xcode 4.6 were released. 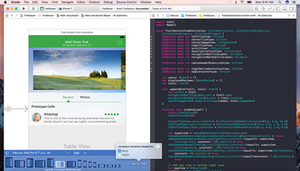 On June 2, 2014 at the Worldwide Developers Conference, Apple announced version 6 of Xcode. One of the most notable features was support for Swift, an all-new programming language developed by Apple. Xcode 6 also included features like Playgrounds and live debugging tools. On September 17, 2014, at the same time, iOS and Xcode 6 were released. Xcode could be downloaded on the Mac App Store. On June 8, 2015 at the Apple Worldwide Developers Conference Xcode version 7 was announced. It introduced support for Swift 2, and Metal for OS X, and added support for deploying on iOS devices without an Apple Developer license. Xcode 7 was released on September 16, 2015. On June 13, 2016 at the Apple Worldwide Developers Conference Xcode version 8 was announced. It introduced support for Swift 3. Xcode 8 was released on September 13, 2016. On June 5, 2017 at the Apple Worldwide Developers Conference Xcode version 9 was announced. It introduced support for Swift 4 and Metal 2. It also introduced remotely debugging iOS and tvOS devices wirelessly through WiFi. Xcode 9 was publicly released on September 19, 2017. On June 4, 2018, at the Apple Worldwide Developers Conference, Xcode version 10 was announced; a beta version was released the same day. Xcode 10 introduced support for the Dark Mode announced for macOS Mojave, the collaboration platforms Bitbucket and GitLab (in addition to GitHub), training machine learning models from playgrounds, and the new features in Swift 4.2 and Metal 2.1, as well as improvements to the editor and the project build system. Xcode 10 also dropped support for building 32-bit macOS apps and no longer supports Subversion integration. Xcode 10 was publicly released on September 17, 2018. ^ "Xcode 10.2 (10E1001) - Releases - Apple Developer". Apple Developer. Apple Inc. April 17, 2019. Retrieved April 17, 2019. ^ "Xcode 10.2 beta 4 (10P107d) - Releases - Apple Developer". Apple Developer. Apple Inc. March 4, 2019. Retrieved March 4, 2019. ^ a b "Xcode on the Mac App Store". Apple Inc. Retrieved May 29, 2018. ^ "Downloads". Apple Developer. Retrieved May 29, 2018. ^ Adriaan van Os. "GNU Pascal and Xcode". Microbizz.nl. Retrieved June 21, 2010. ^ "Using Free Pascal with Xcode". Pascal-central.com. Retrieved June 21, 2010. ^ "Tools". macada.org. Retrieved February 8, 2011. ^ "CSharpPlugin - cocoa-sharp-dev - Google Code". Code.google.com. Retrieved June 21, 2010. ^ "CamelBones, an Objective-C/Perl bridge for Mac OS X & GNUStep - Home". Camelbones.sourceforge.net. December 1, 2004. Retrieved June 21, 2010. ^ "D for Xcode". Retrieved February 9, 2019. ^ Prince McLean (June 20, 2008). "Apple's other open secret: the LLVM Compiler". Retrieved April 3, 2012. ^ "Xcode 3.2: teh awesome edition". August 30, 2009. Archived from the original on June 16, 2013. ^ a b "New Features in Xcode 4: Xcode 4.2". Apple. September 16, 2015. Retrieved September 15, 2016. ^ a b "New Features in Xcode 4: Xcode 4.5". Apple Inc. September 16, 2015. Retrieved October 18, 2015. ^ "New Features in Xcode 5: Xcode 5.0". September 16, 2015. Retrieved September 15, 2016. ^ David Holt says: (May 15, 2010). "Facts about WebObjects (WebObjects Community)". Wocommunity.org. Retrieved June 21, 2010. ^ "WOLips". Wiki.objectstyle.org. February 27, 2010. Retrieved June 21, 2010. ^ "Apple - Mac OS X Leopard - Features - 300+ New Features". Archived from the original on October 16, 2007. ^ "Apple Developer Tools for Java". Apple. Retrieved February 8, 2011. ^ "WWDC Software Notes: Safari 5, Xcode 4, iTunes 9.2". Mac Rumors. June 8, 2010. Retrieved June 21, 2010. ^ "Developer Tools - What's New in Xcode 4". Apple Developer. Retrieved February 8, 2011. ^ "Apple makes Xcode free to all with release of 4.1 on Mac App Store". AppleInsider. July 20, 2011. Retrieved July 3, 2013. ^ "New Features in Xcode 4: Xcode 4.1". Apple Inc. Retrieved September 15, 2016. ^ "Why can't I download Xcode 4.2 for Snow Leopard?". Retrieved May 2, 2015. ^ "New Features in Xcode 4: Xcode 4.3". Apple Inc. Retrieved September 15, 2016. ^ "New Features in Xcode 4: Xcode 4.3.1 and 4.3.2". Apple Inc. Retrieved September 15, 2016. ^ "New Features in Xcode 4: Xcode 4.3.3". Apple Inc. Retrieved September 15, 2016. ^ "Xcode 4.4 rolls out to OS X, iOS developers via the Mac App Store". 9to5Mac. July 25, 2012. Retrieved August 2, 2012. ^ "New Features in Xcode 4: Xcode 4.4". Apple Inc. Retrieved September 15, 2016. ^ "Apple seeds first iOS 7 and OS X Mavericks betas to developers". AppleInsider. June 10, 2013. Retrieved June 11, 2013. ^ "New Features in Xcode 5: Xcode 5.1". April 20, 2015. Retrieved September 15, 2016. ^ "Xcode 6, Swift, CloudKit, and more surprising developer news from WWDC 2014". TechRepublic. June 5, 2014. Retrieved June 6, 2014. ^ "New Features in Xcode 7: Xcode 7.0". developer.apple.com. Retrieved September 15, 2016. ^ "What's New in Xcode 8". developer.apple.com. Retrieved 2016-09-15. ^ "What's New in Xcode 9". developer.apple.com. Retrieved 2017-07-24. ^ "New Downloads Now Available". Apple Developer. Apple. Archived from the original on September 20, 2017. Retrieved September 19, 2017. ^ "Xcode - What's New". Retrieved 2018-06-04. ^ "Xcode 10 Release Notes". Retrieved 2018-09-17. ^ "Xcode 10 (10A254a) - Releases - Apple Developer". Apple Developer. Apple Inc. September 17, 2018. Retrieved September 12, 2018. ^ a b "iPhone Software Development: Old versions of iPhone SDK". Retrieved May 2, 2015. ^ "About Xcode for Mac, iPad, and iPhone Xcode 3.2.2 developer tools for Mac SDK 10.6 and iPhone SDK 3.2" (PDF). Apple Developer. Retrieved May 2, 2015. ^ "About Xcode and iOS SDK Xcode 3.2.3 for Mac OS X 10.6 and iOS 4.0.1" (PDF). Apple Developer. Retrieved May 2, 2015. ^ "About Xcode and iOS SDK Xcode 3.2.4 for Mac OS X 10.6 and iOS 4.1" (PDF). Apple Developer. Retrieved May 2, 2015. ^ "About Xcode and iOS SDK Xcode 3.2.5 for Mac OS X 10.6 and iOS 4.2" (PDF). Apple Developer. Retrieved May 2, 2015. ^ "About Xcode and iOS SDK - Xcode 3.2.6 for Mac OS X 10.6 and iOS 4.3 (Developers only)" (PDF). Apple Developer. Retrieved May 2, 2015. ^ "About Xcode and iOS SDK - Xcode 4.0.1 and iOS 4.3 (Developers only)" (PDF). Apple Developer. Retrieved May 2, 2015. ^ "About Xcode 4.1 for Snow Leopard (Developers only)" (PDF). Retrieved May 2, 2015. ^ "About Xcode 4.2 for Snow Leopard (Developers only)" (PDF). Retrieved May 2, 2015. ^ "How to Install Older iOS Simulators in XCode 4.2.1 (SDK5.0)". Retrieved May 2, 2015. ^ "iphone - Xcode 4.2.1 for Snow Leopard - Stack Overflow". Retrieved May 2, 2015. ^ "iphone - Install Simulator SDK 4.3 to Xcode 4.4 on Mountain Lion - Stack Overflow". Retrieved May 2, 2015. ^ "Xcode 4.4 Release Notes" (PDF). Apple Developer. Retrieved May 2, 2015. ^ "Unauthorized - Apple Developer" (PDF). Retrieved May 2, 2015. ^ "Xcode 5 and iOS 7: Architecture and Valid architectures". ^ "ios5 - Use iOS 5 Simulator in XCode 5? - Stack Overflow". Retrieved May 2, 2015. ^ "About 64-Bit Cocoa Touch Apps". ^ "Install ios 5 simulator to xcode 5.1?". Retrieved May 2, 2015. ^ "iphone - ios 6.0 Simulator in xcode 5.1 - Stack Overflow". Retrieved May 2, 2015. ^ "ios - Xcode 6 Standard architectures exclude armv7s - Stack Overflow". Retrieved May 2, 2015. ^ "xcode - iOS 6.1 simulator on OSX 10.10 Yosemite - Stack Overflow". Retrieved May 2, 2015. ^ a b c d e f g h i j k l m n o p q r s t u v w x y z aa ab ac ad ae af ag ah ai aj ak al am an ao ap aq ar as at au av aw "Xcode clang version record gist". Retrieved May 29, 2013. ^ a b c d e f g h i j k l m n o p "Clang - Source Browser". opensource.apple.com. Apple Inc. Retrieved 2017-05-11. ^ "swift-llvm/CMakeLists.txt at swift-4.0-RELEASE". Retrieved 2018-11-18. ^ "swift-llvm/CMakeLists.txt at swift-4.0.2-RELEASE". Retrieved 2018-11-18. ^ "swift-llvm/CMakeLists.txt at swift-4.0.3-RELEASE". Retrieved 2018-11-18. ^ a b "swift-llvm/CMakeLists.txt at swift-4.1-RELEASE". Retrieved 2018-11-18. ^ a b "swift-llvm/CMakeLists.txt at swift-4.1.2-RELEASE". Retrieved 2018-11-18. ^ "swift-llvm/CMakeLists.txt at swift-4.2-RELEASE". Retrieved 2018-11-18. ^ "swift-llvm/CMakeLists.txt at swift-4.2.1-RELEASE". Retrieved 2018-11-18. ^ "swift-llvm/CMakeLists.txt at swift-5.0-RELEASE". Retrieved 2019-04-10.